Алексей, это с недавних пор так стало? Раньше вроде отправляли… Кстати, как там ситуация с вашим другом разрядилась? Я позвонил своему человеку в B&H и он сказал что ничем не сможет помочь пока USPS не найдет посылку. Да, друг уже все получил. Повторно они отправили с рекордно быстрой скоростью. Большое спасибо. А с Никоном – это буквально неделю-полторы. Скорее всего БиХа заключила с Никоном региональное соглашение о продажах только в своем “регионе”. Тогда же и появился значок Никона на его товарах, представленных на БиХе. Жаль. В принципе я купил основные стекла. А 400/2.8 все равно придется в штатах брать или самому приезжать или оказию заказывать. Правда рассчитываю, может Никон полтинник 1.2 выпустит. Но есть цейсовский 1.4 и 2.0, правда мануальные. Вспышку я все равно хотел квантумовскую покупать для дочки. А мелочь – типа 24-120/4 для дочки куплю у себя. Я теперь с БиХи каждый месяц чего то заказываю, так как Адорама на Россию не шлет. Кстати очень 35/1.4 нравится, даже больше чем 24-ка, хотя это разные фокусные, но по рисунку – 35-ка – очень:)))) Спасибо. Works great with the Nikkor 105mm Micro VR as well ! I remember reading this quite awhile back and always meant to comment…..
With any TC, the 105mm hunts, even on the D800 and D4. And even with bright sunlight. Sometimes it cooperates and sometimes it doesn’t. I think it might work better on the D4, as far as AF goes, but I might have just been luckier. Hard to tell. Small DOF makes working the 105 w/ TC tough. I’d rather shoot the 105 micro at f/11 without a TC and then crop if necessary, than use the TC unless I am focusing manually and using a tripod. Also – there is more DOF at f/11 on without a TC than at f 11 or 16 with one and then you get more degradation with diffusion. Add diffusion on top of lower IQ with the TC to start with and you might find the 105 micro works best on its own. works with a 70-200mm f/4 as well. A very thorough review Nasim, as usual! :-) I have enjoyed using the TC-20E III on my 70-200mm f/2.8G VR II. Your tests and review pretty closely match my real word experience with the combination in the past few months. I would love to get a 300mm f/2.8 or 400mm f/2.8 next, if enough work comes in over the summer. (Of course, a D800 will probably kill that idea and save me some dough, haha!) Did you get a chance to try the TC-20E III much on the 400mm f/2.8? I wonder if it works as well as on the 300mm f/2.8? Wow is there a huge price jump between the two lenses! Ain’t that the truth! Almost makes sense to go for a 500mm f/4 instead, except I already own a nice TC-20E III if it works well on the 400mm f/2.8. Thanks! Aaron, unfortunately, the Nikon 500mm f/4 only works well with the TC14E II and relatively well with the TC17-E II. If you need the reach and good IQ, I would suggest getting the 400mm f/2.8G, since you can get to 800mm with the TC-2oE III and still have f/5.6 as maximum aperture. Obviously you will have to stop down to f/8 to get sharper images, but at least you won’t have to worry about constant AF issues. That’s where I was leaning. Glad to hear you concur! Where the 500mm f4.0 excels is that it weighs a lot less than either the 400 f2.8 or the 600mm cannon, and still counts as carry-on luggage. It appears to work quite well with the TC 1.7 – just do an exif search for 850mm…! I got to play with a friend’s Canon 600mm f/4 on a 5D Mark II. Cost twice what my truck did though! Haha! I am a beginner hobby photographer. This is a very good review, although much of it may still be “over my head!” I have a Nikon D5000 with two kit lenses, a the 70-300 F/4.5-5.6 G VR and the 18-55 F/3.5-5.6 (?) VR that I’ve been shooting with for about a year and a half. I like to shoot grandkids in motion, sports, and birds. The 70-300 of course is what I use most. For quite a while it seems that my sharp photos are almost non-existent, which could be my skills, of course. I have been wanting to get a 2.8 lens hoping to improve on the sharpness. If you don’t mind making recommendations for people, I would really appreciate it if you could recommend a lens for my D5000. And I’m afraid it might have to have AF-S as well as VR. I also would like to venture into the macro area, and have been looking at the 85mm and 105mm macro lens. Could you make recommendations to a beginner? I would surely appreciate it. I so enjoy receiving the emails you send out, and I LOVE your birds, especially the raptors. Thank you for your feedback Peggy! The Nikon 70-300mm VR lens you have is a good lens that should be able to deliver sharp results. When shooting with long lenses on DX cameras like Nikon D5000, you have to be very careful about your shutter speed and I suggest using the center focus point to get more accurate results. A faster lens will certainly help in getting better images due to faster autofocus, but you might want to learn how to use your existing lens effectively first. As for a macro lens, I highly recommend the Nikon 105mm f/2.8G VR macro lens – I personally use it and love it. If you do decide to go with a faster lens and you need to be able to stay far back from your subjects, then the only lens I would recommend is the Nikon 70-200mm f/2.8G VR II. It is a very expensive lens though. You can also get the older and cheaper Nikon 80-200mm f/2.8D lens, but it has no VR. Yes, thank you very much. May I ask one more? Can you use a teleconverter on the 105mm f/2.8G VR macro to make it long enough to get a decent bird photo (one fairly near, in a tree, for example)? Peggy, no, I would not recommend to use the 105mm for bird photography…unless the bird is several feet away from you. Хороший отзыв. Я как-то смотрел сравнение 20Е и 14E. Качество заметно раличалось, но, если я помню, это были вторые версии. Поэтому решил не покупать для своей 70-200 VRI. Теперь всерьёз задумался. Thanks indeed for this review, I am just considering to buy a new 70-200 2.8 vr ii paired with this TC. I have one question though… As I understood from the article, the lens won’t autofocus beyond app f5.6 (“Nikon clearly points out that autofocus does not work beyond f/5.6”). Does it mean that I will have to switch to manual focus if I want to go to smaller appertures than 5.6? That only means the maximum aperture of the lens, not whatever you manually set it to. :-) Autofocus needs at least f/5.6 to get enough light to focus. The aperture will stop down to whatever you manually set it to when the photo is taken. I regularly use the 70-200mm VR II with the TC-20E III at f/8 for sharper photos and it focuses pretty well, a little sluggish on moving birds but great on still objects, especially with live view on a tripod. Alisher, sorry for a late response – looks like Aaron already answered your question :) Thanks Aaron! I am using D300S & 70-300 VR, off course not satisfied with this lens’ performance at low light & at long focal lengths especially while shooting wildlife, but sometime managed to get the best results with VR off and on tripod, still I love it because it gives excellent results in its 70mm to 200mm range when there is decent light and especially for portraits. I was planning to buy your all time favorite lens 300mm f/4 after reading the reviews, later I thought of buying 300mm f/2.8 because of realizing that I need more reach and now saving for it. We don’t have here lenses on rental; otherwise I may try it myself. Since you are experienced with both the lenses, you may able to assume the results. I’m curious to hear Nasim’s reply on this. The 70-200mm f/2.8 VR II with the TC-20E III is sharper and faster focusing at 400mm than my 70-300mm first gen was (but it had no AF-S and no VR). The 70-200mm and 2x tele combo is slightly sharper at f/5.6 and noticeably so by f/8 in comparison. Focusing of course is much improved with AF-S. Maybe “sharpness” wasn’t so much the problem for me as chromatic aberration making all the edges soft with purple fringing. I had a lot of that with my 70-300mm first gen after 200mm, and I just don’t get that with the 70-200mm and 2x tele at 400mm. Makes it seem much sharper at any rate. I suspect you’d see some of the same difference with your scenario. Does www.borrowlenses.com ship to your location? I’ve used them a bit in the past. Having used the 70-200mm f/2.8 VR II and TC-20E III combo for a couple months now, I’m noticing that I’m not getting sharp images focused at infinity, only on closer subjects. Doesn’t seem to matter what aperture (tried f/8 to f/16). I’ve started using tripod and live view, but I’m still not getting what I desire. It’s not bad, just noticeably soft. I’m talking VERY far away objects though like the moon and distant mountains. I’ve been blaming it on atmospheric conditions, but I’ve recently been shooting the same subject without the 2x tele, cropping in Lightroom, and getting sharper results. Things closer than say a quarter mile (just before infinity) aren’t showing this softness. It’s not the shutter speed since I can shoot the moon at 1/1000 and f/8 with auto ISO, just for a test, and get the same results. Turning off VR when on the tripod doesn’t seem to make any difference. Maybe my D700’s autofocus is just off? My eyes aren’t good enough to manually focus anymore. :-P Just curious if anyone else has softness at infinity with this combo compared to closer focus distances? Aaaron, sorry for a late reply. I also had a similar experience with the TC-20E III+70-200mm when shooting distant subjects. I had to tweak the focus ring manually after acquiring the focus through live view and I had much better results afterwards. This only happened in relatively low light though – AF was much more reliable in bright conditions. I don’t think your D700’s AF is off…have you had a chance to test your 70-200mm for focus issues? I have been going through the same phase on a 70-200VR II + TC 20 EIII. Still looking for a right aperture choice to make pics closer to the 400 mm end look little sharp..
For ex., www.flickr.com/photo…hotostream shot is at 400 mm F/5.6 .. pretty good light.. easy for AF cross points to get a focus as well as the backgorund is pretty much plain. I had to size down the pic to get a decent image out of it (2:1). Will f/8 work wonders at 400 mm? Thank you for your feedback KSQ! Ruben, autofocus is even less reliable with the TC-14E II on the 105mm f/2.8G – I would not recommend it. Also, the only thing TC-14E II will give you is more reach, not much change in perspective. You put in your chart that the AF-S Micro-NIKKOR 105mm f/2.8G IF-ED VR does not auto focus using the Nikon TC-20E III, but it does and also the VR works. Jude, ONLY the lenses listed in the above lens chart are compatible with Nikon teleconverters, so your 70-300mm cannot be used with any TC. I have a Nikon f/4 70-200mm lens and it works with the TC-20E III ok. Looks like the list above is out of date or wrong. I’ve bought 70-200mm f/2.8 VRII… And now, I’m considering to buy a TC 1.7 II or a TC 2.0E III… Which TC you’ll suggest for a better AF performance and sharpness? I have been using my Nikkor 200-400 zoom a lot for bird photography. However, at F4 it is not a super-fast lens, to be sure, and I see by the table that F11 is the optimal f stop. My question is, do you feel the 200-400 is workable with the new 2x teleconverter? Bill, forget about TC-20E III on the 200-400mm…AF won’t work at all. You can get reasonable sharpness on a tripod with manual focus, but that’s about it. Thanks Nasim, that’s what I thought you’d say. Maybe I’ll save up for the 600mm – wish Nikon had an 800 similar to Canon but I’m sure that’s not in the cards. I have a D300 and a 300mm f2.8 VRI and the TC2.0e iii. However I can not get sharp images, they are ok at taken resolution, however they are poor if cropped, the 300 on its own gives better images cropped to fill the frame. Would you recommend changing the 2.0x converter for a 1.4x to get better quality, or would the D700 with a FX sensor give images that could be cropped when using the 2.0x Tc. I know I would loss the 1.5x factor. Today I was taking short ear owls with the d300, 300mm and tc2.0 these where on a tripod and i used a fluid head, however I am not happy with the results. I heard that this teleconverter with the new 70-200 looks great on the FX bodies and not so much on DX bodies. I think in your tests it would be great if you mention what camera you used as it will help readers like me relate with their camera bodies. If you have already and i missed it then i apologize. I have just bought Nikon AFS 300F2.8 VR lens. Can I use TC 2X EIII with this lens? Thanks Nasim for quick reply. I have one more query What is major difference between Nikon AFS 300F2.8VR and Nikon AFS 300F2.8VRII lens. How is the performance of TC 2X EIII varies with these lenses? Performance with the TC-20E III won’t matter with either lens. Thanks Nasim for the reply. For better picture quality and AF with Nikon AFS 300F2.8 VR lens, which TC will you recommend ? Since I have the 80 to 200 F2.8D lens for my D300 I could not use a Nikon branded TC. I opted for the 7 element 2X Kenko. It works with the AF-s as well as the D optics. The same issues of low light auto focusing apply-manual after you are at an effective f5.6. I have a D7000 and just bought a used AF-S NIKKOR 70-200 VR (older model). So far I’m impressed and plan to use it a few weeks before adding a TC but I’d like to get closer to objects before an upcoming trip this spring. I can’t understand why the VRII can stop down to f/5.6 while the VR must be at f/11 as I thought they had the same glass. What if manually focused? Would a TC-17E II work better with my VR? Tell us more. At what shutter speed and what aperature are you shooting? Optimum lens opening is usually 2 stops down from wide open, but each lens varies so you have to test. If your shutter speed is less than 1/200 and your lens is at f2.8 it is doubtful you will get good sharpness handheld. Your reviews are outstanding. It shows that you have put a lot of work into these reviews and you clearly communicate the content to the reader. I primarily shoot wildlife but do enjoy shooting anything that has impact. I have owned a few Nikon 300 f2.8’s: a VRI and VRII and a manual focusing one back in the 1980’s. I love the 300 f2.8 formula for its compactness and great weight distribution for manageable portability, its pro-level sharpness, its usefullness throughout photography’s entire scope……….. and that magical VR! I do not own one now but am thinking about re-purchasing one (a VR or VRII). I just missed (Feb 2012) a 300 VRI in demo condition for $4500! I hesitated and now it is gone. So I now have to wait some more or spring for the new VRII again. I am encouraged by these results you have shown because for me the 300 is more applicable to a wider range of photography than the 500 f4 and I cannot afford a 300 2.8 plus a 600 f4. So, the 300 2.8 would have to do it all. In a pinch for extra long reach I would attach the TC 20 III and with practice I now know that I could get results that I suspect would satisify me……….again, in a pinch. “I’ve bought the 70-200mm f/2.8 VRII… And now, I’m considering to buy a TC 1.7 II or a TC 2.0E III… Which TC you’ll suggest for a better AF performance and sharpness?” . Please, could you give me advice ? Greetings, Jorge. Please can you give me any idea why I can only achieve very soft images with the 300mm f2.8 VR I lense TC20e III with my D300, d300 set at 1/1000 s, f8, 21 points , spot exposure, single area AF, iso 400. Tripod and mirror up. The images are still very soft and not usable, I am better croping my 300mm lens images which have been handheld. Since having the converter over a year now I have tried various ways to get a sharp image with no results. Today with a friend who was a professional motor soart photography in the days of film we tried the above and he could not see why they are so soft. Any possible ideas, the 300mm f2.8 has been serviced by nikon, this is my second converter and the 300f2.8 works fine on its own. Try focusing with liveview to be sure it’s focusing correctly, if not, try AF Fine-Tune. Try shooting a bracketed test at each aperature. How are you releasing the shutter? It is possible that the autofocus at f8 needs a manual “touch up”for optimum sharpness-you’d never know with the mirror up. How sturdy is your tripod/ball head, etc? Is the VR turned on or off when it is tripod mounted-try it each way. How can the focus be set to 21 points and single area at the same time? You want to be focusing on one area unless you are covering sports action, yes? Would you recommend the following for shooting outside sports ( soccer) ? 70-200mm VRII 2.8 with TC-20E III ? Would other TC work best ? I just got a 300mm f/2.8G VR II + TC-20E III. As you have mentioned in your 300mm f/2.8 review, the lens is superb and VERY sharp. 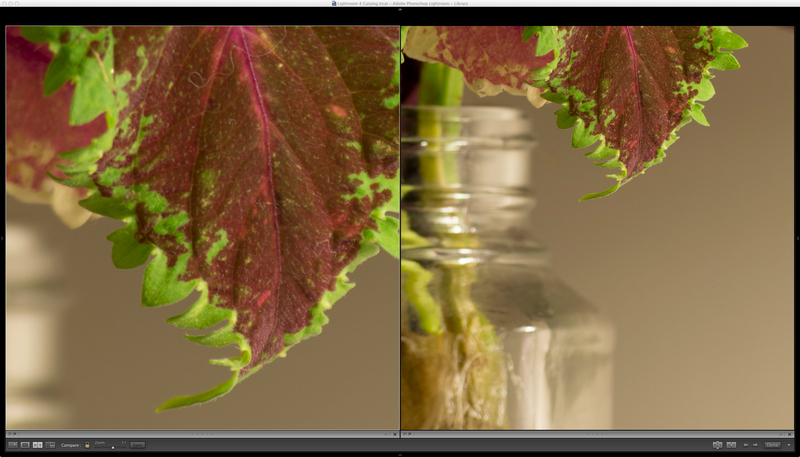 Both images were shot with raw at f/8 on a tripod and focused with D800’s live view. No sharpening has been applied yet. The image on the left was shot with the tc-20E III. As you can see the image without TC-20E III is MUCH sharper. Based on your experience with the combo and telephoto lens in general, do you think the level of image degradation i experienced with my TC-20E III is normal? Also regarding the 70-200 vrll and the TC- 20lll would you please share a setting combo that would allow me to shoot fast moving birds- I tried all day only to receive motion blur regarding moving objects- disappointing since I purchased it to capture wild birds. I took a lesson w/ a pro yesterday using the 70-200 vrll and the TC- 20lll he empahsized shooting fast & he meant fast @ 8000 s & 5.6 a & ISO up 1600-I got great action shots-wish there was a way to acheive the same results w/low ISO but did not seem possible! This is just back to basic photography. The longer the lens,the faster the shutter speed needs to be to get a sharp image handheld. Adding a TC makes the lens longer,so this rule applies. Wanting to achieve this AND use a low ISO is like “having your cake and eating it too” -it is a select one or the other situation. Wonderful that today’s technology allows for the high ISO w/ noise reduction ability- starting to feel like we are able to have “have our cake & eat it too”! I have the Nikon 70-200 f/2.8 VRII and I would like to buy the Nikon TC-20E III for general-purpose but i m concerned about the IQ (especially with the queen – Nikon D800) so i think more and more about the Nikon TC 17E II. What do u think will be the best choice for me? Eran, the TC-20E III is good, but requires stopping down to f/8 to get the best results. If you are worried about pixel-level quality, then go with the TC-17E II. Your reviews are great and provide really useful information. I already have the 70-200 VR II on my D800 and is intending to extend the range of the 70-200mm for occasional Birding should i chance upon interesting birds while doing landscape photography. I had seen a mix bag of reviews when comparing the TC17E-II and TC20E-III when paired with the 70-200mm f/2.8 VR II. Some say the TC17E-II is clearly worse off while others claim that the TC20E-III is just not as good as the TC17E-II. Most of this mix bag of review comes from dpreviews. Although there are some photos posted which various authors have claimed to be TC20E-III + 70-200 VR II, but because the meta data does not identify the lens, it is hard to verify the results as they seem too good to have had been produced after a 2 x TC degration. Maybe i am wrong and the TC20E-III is really that good with some post processing. What is your advise or could you point out which photos from your review were actual real environment photos taken with the TC20E-III + 70-200mm VR II? Would you recommend the AF-s 70-200F2.8 VR II with the TC-20E III on a Nikon D800 shooting primarily aviation, very fast action, primarily afternoons and evenings with no tripod – High ISos ? I have this combo & do not think you would be pleased w/the results handheld. 5.6 is the optimum and even on a tripod I am still seeing softness. I’m in much the same position, considering the same combo. And wondering if the TC-17 would be a significantly better alternative to use with the D800 and 70-200 VRII. While he doesn’t cover using that combination with the D800 specifically he does suggest that stopping down to f/8 will yield dramatic increase in pixel level sharpness. I have this exact combination and came to the same conclusion after spending a day shooting wide open. With the incredible resolution you get with the D800 it really highlights the limitations of a lens, so you have to get the absolute best out of lens in order for it to look as good as possible. On the other hand, since you have such incredible resolution you don’t need to have as sharp of an image at pixel level as you are going to re-size it for any normal usage. I am curious to see how people are faring with the D800 and the 300 f/4 with the TC-20E III, as I suspect the D800 can AF with that combination just fine. I have the AF-s 70-200F2.8 VR II and I shoot it on a D4 body. Its fantastic but I need more reach and I was thinking off the TC-20E III. Do you think I’ll be happy with the results bearing in mind I shoot mainly hand held? 400mm f/2.8G ED VR + Nikon TC-20E III? I will use for bird photography, have much loss of AF speed? and the sharpness and colors? would be better to invest in the 500f4 + Tc 1.4xii? d600 + 500/4 vr + tc-14e and use it at f/8. You may even try tc-17e with d600, it might handle such combo pretty well also, keep in ming to stop down. Hi Nassim, I am happy with my D800E with Nikon 300mm f4.0 AND Nikon TC1.4 and I could cropped the image more. I tried out the Nikon TC2.0III from a friend and the the auto focusing worked very well except the 3d tracking could not worked. Since I lost the crop factor , I am trying to make up with it . Do you advise me to get the TC 2.0III or the TC1.7E or still put with my current TC1.4.? Because my len is f4.0 aperture, do you think the quality will be good with higher ext converter. As usual a very useful review. One correction: Although the manual states the 105mm vr lens will not AF my 1.7 does. Another reviewer reported that his 2x also would AF. Perhaps I misunderstood what you were saying? So which would have better AF performance for birds in flight in conjunction with the 2x TC? The 200mm f/2 or 300mm f/2.8? TIA! Have you had a chance to try it on the 70-200 f4? I’ve seen some comments were surprisingly good, even besting the 2.8 at f8. Thanks so much for the very elaborate and detailed review. It really helps especially for someone like me who cant afford very expensive lens. I have a len 20-300 mm f3.5-5.6 ED VR. Does the TC 20E III works fine with it? Will the TC-20E III works as well with this non-VR 300mm lens as with the VR versions? Yes it does and AF at F8 works on the D600/D800/D4 with limitations on which AF points you can use. You can check the Nikon USA website and under the product tutorial, they explain how the AF points work at f/5.6, f/6.3, f/8. I have personally used it to AF birds in flight at F8 on a D800 and even with the slow FPS, managed to retain 80% of the shots. Thom Hogan rates this TC and the Nikon 200-400 f/4 as very good at f/8 with full AF. Maybe an update is needed to your review? in the range between 200 and 400 is the new 80-400 AF-S f4.5/5.6 working better than the 70-200 VRII f2.8 + TC 20EIII? I recently acquired the 300mm f/4 lens and have been playing with a 2x teleconverter for extended reach. I think one has to recognise that i) there will be image deterioration and ii) you will lose stops and all that goes with it. However, one also has to recognise that I now have a 600mm lens for £1,000 (lens + TC). It’s not just a case of ‘saving’ £4,000 on buying a standard 600mm, but more that the regular 600mm is simply not within most amateurs’ financial reach. Accepting all this, I have been delighted with the results of the 2x teleconverter paired with my 300mm f/4. On a D800 body in normal daylight, the autofocus does work despite the f/8 aperture, and it’s reasonably fast and accurate if the target is big and bold (like a formula 1 race car). The results so far have also been more than acceptable. I know when the sun is beginning to go down, the teleconverter has to come off and I’m back to 300mm. That’s the price of having a ‘cheap’ 600mm lens. But during the day when the sun is in the sky, as it is at most big sporting events where I like to shoot, and where as a member of the ticket buying public I’m some way from the action, I have found it a wonderful solution to an otherwise affordable alternative. There’s a reason why a 600mm prime costs what it costs, but rarely can you save so much money and yet get such an acceptable result. Only if you’re a pro can I imagine the drop off in performance being unacceptable. In short, I’m delighted. How would you suspect the TC 2.0-lll to work with the D800 with a 70-200 VR-ll attached. The D800 is supposed to focus well to F8. I am considering purchasing the Nikon TC-20E III for use with the 70-200mm f/4 lens. I mostly use this lens (on a D800E body) on my nature hikes to take pictures of any interesting wildlife or flowers I see on the trails; ranging from alligators, horses, butterflies, dragonflies, birds (stationary and in-flight), etc. The comments above mostly discussed using the TC-20E III with the 70-200mm f/2.8 lens. I’m wondering whether anyone has used it with the 70-200mm f/4 lens and what the experience is like in terms of auto-focus and sharpness of photo. Any guidance overall as to using this TC with the 70-200mm f/4 lens would also be much appreciated. Does it matter if you attach the TC to the lens and then the combo to the camera, or if you attach the TC to the camera first, and then attach the lens? Reason, if wish to switch from lens A using the TC to lens B with the TC, would be easier to just switch lenses instead of the combo (fewer steps). Does anyone know how this will work with a Sigma 105mm 2.8 Maro lens? I have a D7100 and a 300mm F4 lens. Is it a good idea to add a 2X converter considering the fact that D7100 can auto-focus at f8? I have always felt i needed at least 600mm reach for capturing birds and with the current 300mm set-up i heavily crop and the images are noisy. So what i really want to know here is, if i have a 600mm reach at f8 or even f 11 for optimal sharpness, i can increase my ISO speed (D7100 still has a better ISO performance though not comparable with full frames) and would the resultant image with zero cropping, using 2X tele be still better than using 300 f4 with heavy cropping? Please help. Nasim, did you update the use of the TC2.0E III with the 70-200 F4? I thought I saw this compared to use with the 2.8 and it worked great. I have tried to find the update but cannot. Nikon indicates that there is AF Limitations, specifically to an f8 limit. Did I misread something? Thanks for your help. I own this TC as well as the TC-14E and TC-17E. I have been using them for many years. Could you please help me to make a decision about buying this teleconvertor Nikon TC-20E III? Now this is my question: is it worth buying this tool for my primes and the latest creation of Nikon(200-500 mm)? I will have serious problem with Nikon 200-500mm + Nikon TC-20E III for catch my hunts?? My favorite subjects are still birds and Landscape. And what is your Idea about the new Beautiful wizard of Nikon , Nikon 24-70 f2.8 VR? I also use this TC with my 105VR for most of my macro shots. The VR really helps when shooting handheld macros with a TC. Thanks Steve for posting the photos from your 200-500 lens with the TC-20EIII. I have the converter and was looking at the Nikon AF-S NIKKOR 200-500mm f/5.6E ED VR Lens for moon shots like yours in place of my non-DSLR superzoom cameras which I have reached the quality limits of. I look forward to purchasing the 200-500 lens now after seeing your photos! I was wondering if you have found any differences retesting TC sharpness (for example on the 200-400mm) using the new methods you had to develop to test the 800mm f5.6. I would imagine that the combo of a long heavy lens with an effective focal length of 800 (1200 on a DX) would be as susceptible to micro vibrations. Can we use latest Nikon d500/D5 bodies with Nikon 500mm /f4 VR with Nikon 2xTC III Teleconverters. How is the image quality and is this combination viable ? Will it work TC 20E III on my nikon D500? With 70-200 f2.8 VRIi? Hello i would like to ask about bokeh. I have an idea: How about to combine 70-200E with TC-20 III on a portrait for more bokeh? but the loss of sharpness is about 26% (as u said on other article), is that too much loss for portrait? Because the 105mm 1.4E is too much expensive maybe the 200-500 gives same bokeh? Shoot with d750 and d850.